Being a writer myself, (duh,) I’ve known about this organization (IWOSC) for a while now. They’ve invited me to some of their panel discussions and seminars, all of which sound interesting, but, of course, I’m always too busy to attend. So, I was happy that we had a break from football this past week-end, so I could mosey over to the Veterans Auditorium in Culver City, (whose town newspaper I was recently the restaurant critic of, so I always love going there,) to see what their events are all about. The whole thing was an excellent experience. There was no muss or fuss; they just got on with it. It was a roomful of intelligent people trying to gain more knowledge. As a matter of fact, when several audience questions were asked that day, the speaker commented, half to herself, “That’s an intelligent question!” I have a feeling she’s never been confronted with so many superior intellects at one time before! IWOSC President Flo Selfman greeting the assemblage. Photo by Steven Weiner. And it was such a human potpourri! I still always picture writers like I did when I was little, even though I’m one myself now. I picture them to look like my mother, herself a poetess; older and teacher-esque, with glasses, (although hers had just plain glass in the frames; she was always ahead of her time.) So, I was pleasantly surprised to see all ages, ethnicities, and level of hipness. I was so curious to ask what each person’s writing specialty was! 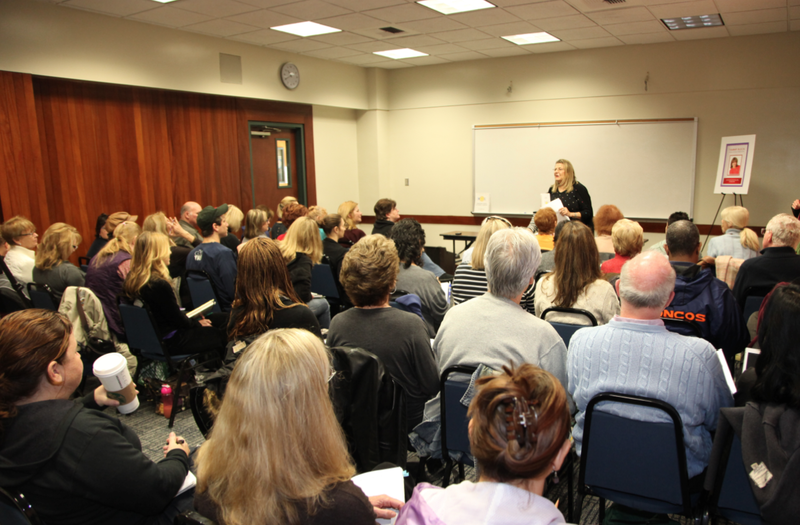 This IWOSC seminar was such a popular event; it was basically standing room only. I witnessed about a dozen people being turned-away; I was actually the very last one to make the cut! Whew! The whole thing was very professionally done; yet it was also a casual, inviting event. Then the assemblage heard from a successful woman writer and blogger, Tammy Bleck, who has a blog called called Witty Woman Writing. She basically walked them through blogging 101, which they all seemed to want to know about. The talk was about two and a half hours, with a break at half-time, and the time passed quickly enough. – Their members are writers of every ilk: authors of fiction and nonfiction, journalists, screenwriters poets, editors, even publicists; all with different levels of success. –They stage several programs each month for education and networking, which focus on the business of writing. –Did someone say parties? They have those, as well, in the form of summer and winter networking events. So, please check out their site to see how you can benefit from this lovely organization. But one word of caution: if you go to one of their events in this same venue, dress in layers. For the two hours we were there, the temperature went through about thirty changes! And that’s not a work of fiction! Thanks so much for writing this article about IWOSC. I am one of the members who was in the audience. To help satisfy your curiosity, I am currently writing a book about the spiritual side of yoga so people who love the physical side will be more aware of what lies beyond that they may not yet have discovered. Maybe some other attendees will tell you about their background, too. So glad you were there to join us!